For me when I think of a public bathhouse in America I immediately think of one that used to be in San Francisco at Ocean Beach built in the late 1800’s. Sutro Baths was a privately owned swimming pool complex in SF. From my understanding though it wasn’t a place to actually take a bath so much as it was different indoor swimming pools of both salt and fresh water. There was also an ice skating rink, a museum and an amphitheater at the facility. Sutro Baths was in use for a number of years but had always struggled with operational costs. After it’s closing the facility had burnt down in 1966. Of course the other type of bath houses that come to mind is the gay bathhouse. Specially the ones that had existed at one time in San Francisco. There was a huge controversy at one time about the gay bathhouses in SF because of the spread of AIDS in the 1980’s. This looks to be an article about the closing of the last “officially” known place in SF. There are also of course legit and sexual based bathhouses across the globe today. Now, on to my personal experience. After getting to onsen, after a one and a half hour bus ride from Sapporo, we found ourselves at a place called Midorinokaze Resort. Unfortunately it looks like they are under construction at the moment so some of the images on their site are design concepts. They also have a Facebook page. We were only going to be there for two days so it was time to get into the baths first thing. The guest rooms looked to be old school traditional Japanese style complete with tatami mat. So it’s time to strip and put on a yukata and grab your towel and oversized wash cloth and head down to the bath. When getting to the place where the bath was, men go to one side and the women to the other. And you thought we all got naked together? Well, so did I at first. So you go in to a small room where you take off your yukata and head into a large room with the hot spring pools. To one side of the room along the wall there was a series of small wash areas with a mirror, tiny stool and soaps to use for washing. I couldn’t find a lot of images out there to describe this but here is one to give you an idea. Basically you sit down at one of these stations facing the mirror and clean your entire body thoroughly. This is a precursor to getting into the hot spring pools. Once clean and ready for the water you basically take your oversized washcloth and hold it over your “area” or just let it hang out and walk to one of the pools. Typically there are many pools with different variations of temperatures. This particular onsen also had outside pools as well as a sauna. The pools were very shallow so you had to squat in the pool to submerge your entire body. Being onsen there is also the benefit of the volcanic minerals from the water from which the water was heated. Talk about really being in touch with the power of the earth. There was no time limit other than the periodic cleanings. The pools are open 24/7. 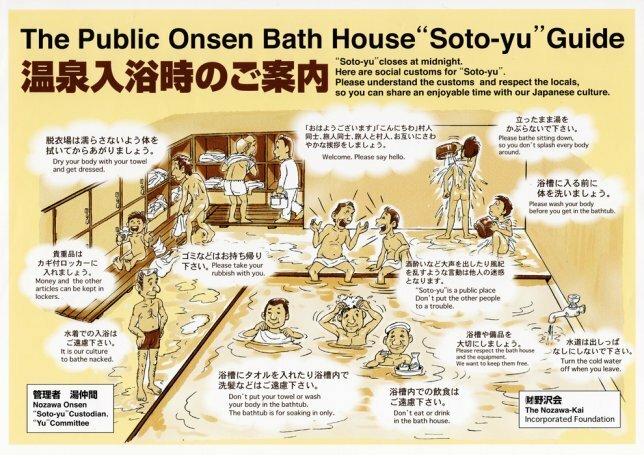 While you spend time at onsen the main purpose to be there is to spend as much time in the baths as possible. Each time you are to clean yourself before entering the pools, which of course makes perfect sense. Also everyone is only wearing their yukata while they are there since there’s no reason to get fully dressed and undressed all the time. The place we stayed at also had two fully catered all you can eat meals a day. And the food was to die for. Of course you have to be into Japanese food, so good. So there you have it in a nutshell. It was quite an amazing experience. I’m ready for another. One thing to note is that my wife was worried they would have a problem with my tattoo’s as to not letting me use the baths. They had explained however since I was a foreigner the likelihood of me being part of the yakuza was unlikely. If you find yourself in Japan, please do find onsen. You can thank me later!